This week I would like to begin this newsletter by saying a huge thank you to all of the Hillside staff for a job well done. Seven years ago we commenced our journey of implementing the PYP at Hillside International Kindergarten. I can remember on more than one occasion (both in my current role as Principal of Hillside and previous role as ESF Kindergarten PYP Adviser) sitting across the table from the Hillside staff at curriculum planning meetings and seeing a great deal of frustration and confusion. What a difference we see now after nearly seven years of working with the PYP curriculum framework. We are proud of our ability to deliver a rich, inquiry-driven, play-based educational program for each and every child and this has been achieved by the professional dedication and hard work of all our staff. Last week, Hillside International Kindergarten had our first IB PYP Evaluation visit. Two representatives for the IB spent three days at Hillside evaluating all aspects of the program that we offer. Hillside’s 5 Year IB PYP Evaluation visit – November 5-7 2018. Programme evaluation is both a requirement and a service provided by the IB Organization to IB World Schools. The aim is for the IB to ensure on a regular basis that the standards and practices of the programmes are being maintained. The Programme standards and practices is the foundational document used by schools and the IB to ensure quality and fidelity in the implementation of its programmes in IB World Schools. The IB is aware that for each school the implementation of an IB programme is a journey and that the school will meet these standards and practices to varying degrees along the way. However, it is expected that the school makes a commitment towards meeting all the standards, practices and programme requirements. This process allows the IB to work closely with schools in their ongoing development of the programmes. It does not seek to appraise or assess individual teachers or students. It is a process of formal reflection involving all stakeholders within the school community. I am pleased to inform our school community that we had an outstanding PYP Evaluation visit. It will be 4-6 weeks before we receive the official recommendation and written report from the IB, however both throughout the visit, and at the end of the three days, the visiting IB team members provided a great deal of positive verbal feedback to us and we are thrilled to share some of this with you now. We will keep you informed of the final outcome as soon as we hear from the IB. The kindergarten staff are outstanding professionals – highly engaged in the program and it was most obvious that the learning needs of the children is the number one priority. Physical / Learning environment outstanding including: displays, overall kindergarten and individual classroom layout, learning centres (in fact, all areas of the Kindergarten). A very well organized visit. Documentation is of extremely high quality, and it is important to note that observations showed that what was occurring in classrooms was equal to, or above, what was stated in various school curriculum and policy documents. At Hillside we pride ourselves on working together as a team. Each and every staff member has worked hard to implement and build the PYP at our school. I would, however, like to say a huge thank you and acknowledge Hillside’s PYP Coordinator / VP Audrey Tang for providing outstanding leadership and guidance throughout all stages of our PYP implementation journey. I know you will join me in congratulating Audrey on a job well done!!! We cordially invite all parents to join us at our annual Hillside Sports Fun Day on next Friday, 23 November at the Hong Kong Football Club in the hockey pitches (3 Sports Road, Happy Valley). Click HERE for the Access Map. The day will begin at 09:00AM for all children (both morning and afternoon classes) with a welcome and a warm up. 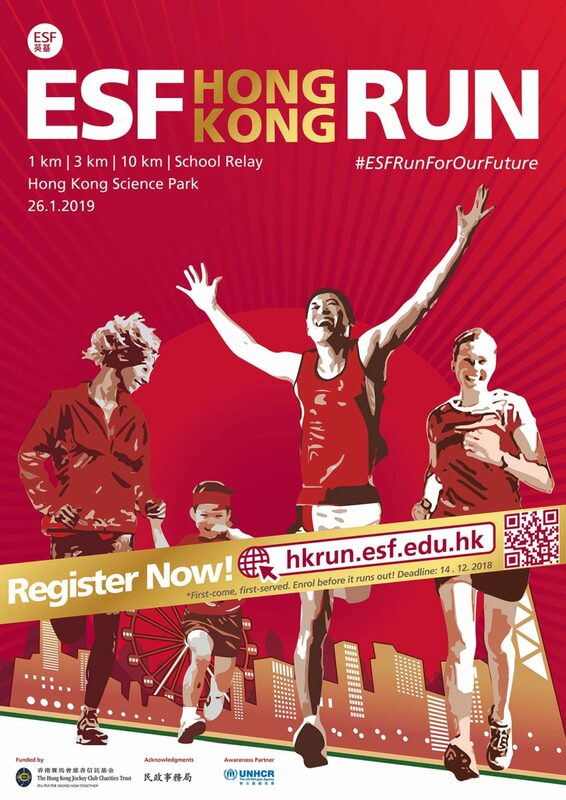 We will meet all families directly in the hockey pitches at the Hong Kong Football Club, and there will be no classes operating at Hillside and no school bus service available on this date. Please do not arrive before 08:45AM so that we have time to set all the activities and equipment on the pitches before the children arrive. The day will conclude around 11:15AM with a break built into the rotational activities to rest those little bodies. Parents can also take their child for a break whenever they feel their child may need one. Due to both the AM and PM classes coming together for this event, we unfortunately do not have capacity for additional children (such as siblings) to attend this event. We appreciate your cooperation and understanding with this request. We would like the children to wear a coloured t-shirt to add to the atmosphere on the day. Please have your child wear a (predominantly) plain, coloured t-shirt to the event according to the list below. The t-shirts do not have to be identical! Commencing from next Monday 19 November 2018, we will have large collection boxes placed in our school foyer ready to receive donations from the Hillside community. We would very much appreciate your support by sending into Hillside with your child some and dry dog and cat food. The outdoor environment is a rich, dynamic and natural space for learning and development in children of all ages. Its value as an essential learning resource has been recognized by many pieces of research into best practice in the Early Years. At Hillside we are fortunate to have an outdoor space (a very rare commodity for most Kindergartens in Hong Kong). This is an area I would like to develop over the next couple of years so that our outdoor area is a natural and authentic extension of our classrooms. Stage (1) of this project has been to establish a natural garden setting – this task was directly linked to K2’s Sharing the Planet Unit of Inquiry a few years ago. As time has passed, we now need to replenish our garden area (and other areas outside with a variety of plants). As the next stage of our greening project, we would like to invite your child to take part in our Dress Green Day on Friday 30 November 2018. It would be greatly appreciated if you able to donate a potted plant to our kindergarten on this day as part of our initiative. The Garden area has actually been established in an area that does not get much sun (we needed to develop an area that would not impact on our twice daily bus drop off and pick up) so any plants that are particularly shade tolerant would be really beneficial (but all donations of any types of plants would be very, very welcome). If you are able to help please send your plant in with your child on Dress Green Day. Many thanks for your support with this initiative.